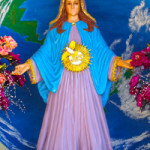 Mother Mary appeared in a brilliant light at the ‘grotto’ at the house of Visionary Valerie, in the first Glorious Mystery, in the 7th Hail Mary and the apparition took 11min. The brilliant light is to alert you, My children, on how to live with each other. My children receive a blessing that comes from all My heart. Thank you for listening and believing in the messages that I and My Son Jesus bring for you. First, I would like to say that many of you have forgotten to pray and to ask for the whole world. Others have fun and others go through pain and hunger, filled with problems. Others dance and live to live. Many of you are still walking in the dark and holding hands with the wrong people. Many of you want things from God and at the same time worldly things. My children, I ask you, which do you prefer? It’s up to you. I say to you, look how to the world is going. Look around you and see how many problems there are. What else would you like? My children open your eyes wide, because temptation is very great. Many times you ask Me if you are going forward or if you going backward. Ask yourselves and look around with whom you are walking. Many of you have been walking with great sins for a long time and you’ve never confessed them so you can remain free of sin. Remember My children that temptation is great in the world. Better grow with faith, love and devotion in a spiritual family and help and love your brothers so that you can receive a miracle that comes from heaven to earth. Don’t be proud, be humble. When you need to speak with a person, think about how you are going to talk to him. Always talk with kindness so you won’t offend and hurt each other. My children, do penitence and sacrifice, fast so that the world can receive a change. Go to Church, pray from your hearts, cry and pray for your entire family not to deviate from the path of God. Don’t be weak, but be strong in faith. If you fall, stand up and keep going, because life will remain difficult. Mothers and fathers, look well after your children, because there’s a lot of abuse going on in the world, even with the elderly. There are a lot of types of abuse, like not giving the elderly food and hitting them. My children, time passes by much quicker than ever. For a moment it’s day time and after a short while it’s night time already. There you can see that you need to work hard to convert your families. My children, I cry for seeing many families broken apart and no longer united like before. Always give respect and love to each other so you can receive the same love in return. Love comes on its own, but it depends on how you brought up your children. Don’t make mistakes and play with each other’s feelings. If you don’t love the person tell him/her the truth. A lot of you don’t love yourselves, imagine loving someone else. My children, I feel pity to see this. Give each other their value when they’re alive, because if they’ve passed, they are no longer there to help you. That is why you must learn to value one another more. Don’t let anyone torment you in your lives to take away your tranquility. You walk without faith, without love and without devotion. I am your Mother filled with love. I am ready to hold your hand and to help you learn how to pray. Don’t lose hope. I’ve come to help you.